Rundholz Black Label Fall/Winter 2017 has arrived and is available online in-store at Workshop. The collection stays true to Carsten and Lenka’s ability to create clothing that is both complex and simple as well as feminine and edgy. Solid color or simple print are swapped out for the new season. This collection’s palette is true red, olive, midnight blue, and black, of course. Those familiar to the avant-garde Rundholz style may see shapes and silhouettes they love in subtle new variations as well as new garments entirely. All Rundholz lines have an inherent timeless quality due to Carsten’s designs being driven by aesthetic and lifestyle, not trend. It is dark and edgy with a feminine and whimsical flare. All of garments give the wearer a voice to tell their personal story. Rundholz Black Label are Mainline silhouettes reimagined in soft jersey, stretch cotton, and other fabrics that are suitable for daily wear. 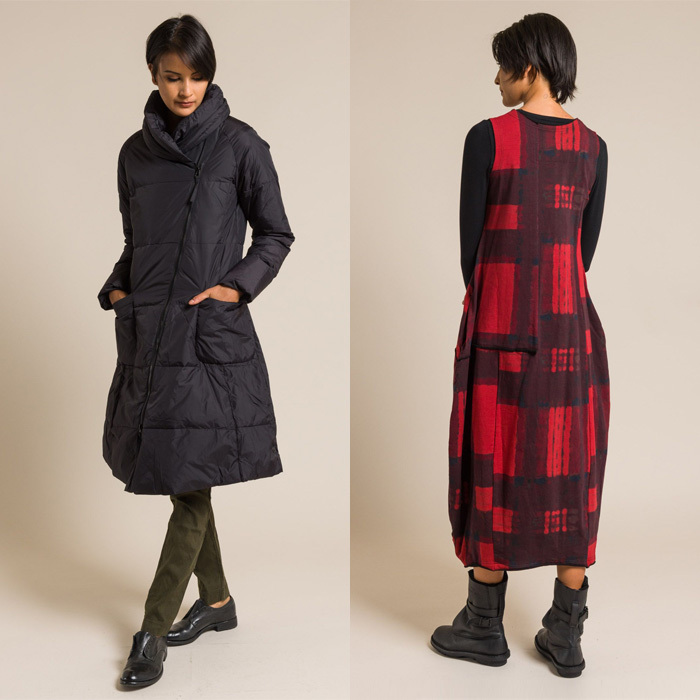 Multiple forms of red and black plaid print cover pieces, black cotton dresses are accented with large sheer black polka dots, and while some pieces combine both plaid and dots others are solid colors. Playful and unconventional is rendered in clothing that feminine and flattering without being ostentatious, even when layered and combined.